Today’s fact: Research indicates that language comprehension skills in people with Down syndrome are almost always better than their language production. Well, last night was costumed-event number 3: Trick-or-Treat Street. This is one put on by the school my mom teaches at, which is pretty much why we go. It’s fun, each room set up has a game or activity and then the kids get candy. Anyway, Kalena decided to change it up with the costumes for last night, so we had a superhero theme going on. 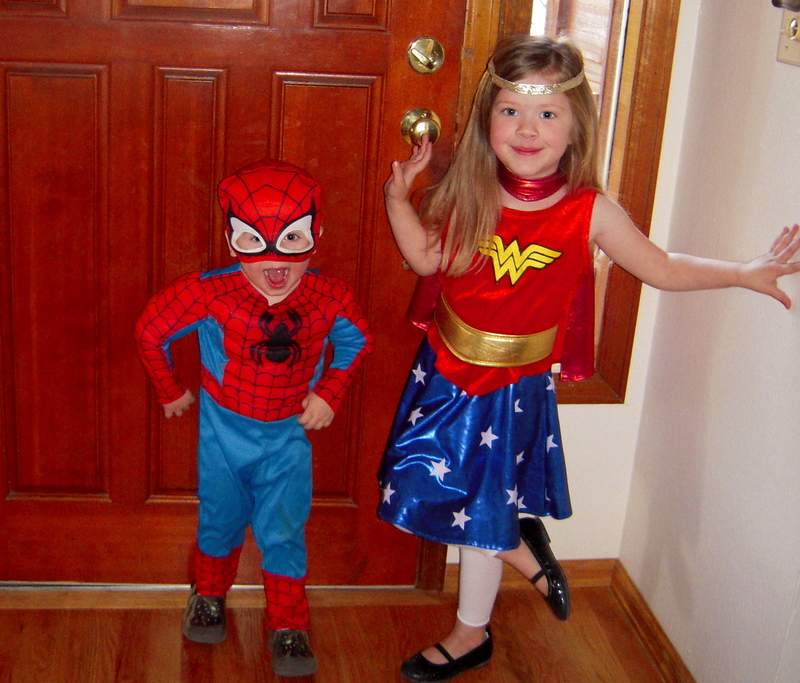 Spider-Man and Wonder-Woman ready to go. 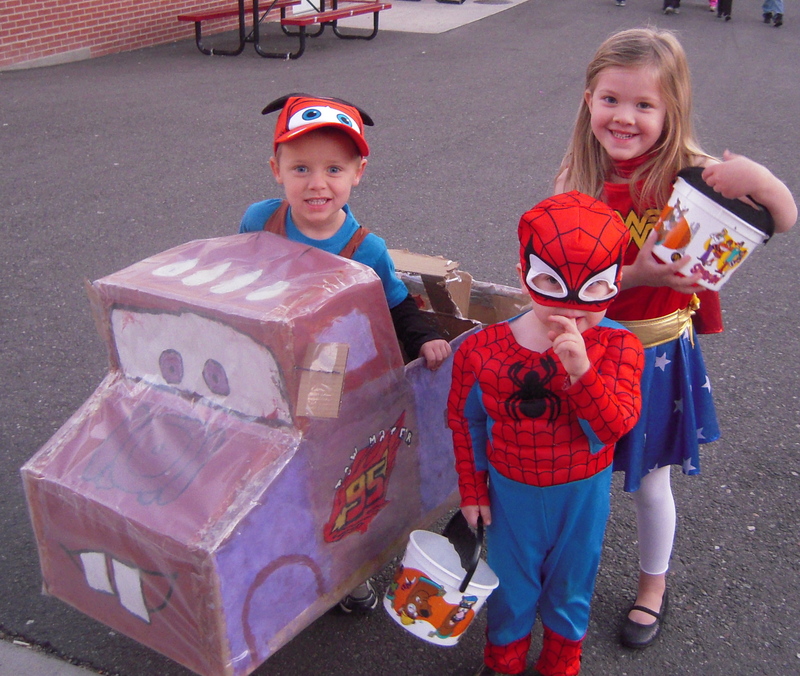 We met up with a friend there, who made her son the awesomest Mater costume ever. This room was Will’s favorite. 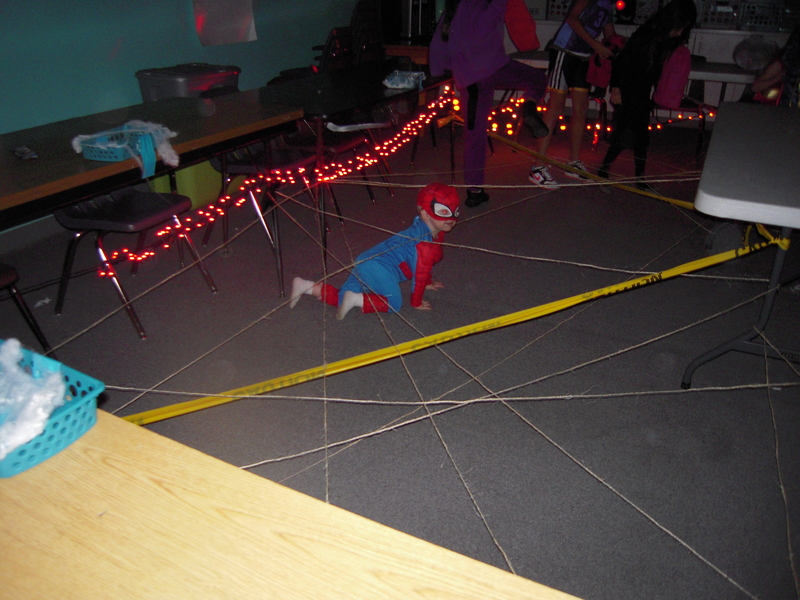 The kids had to crawl under string “webs” to get through, and Will took it very seriously and did lots of “Spider-Man moves” (it was awesome.) He probably would have stayed in there all night being Spider-Man if we had let him. Good times were had by all. Except maybe Daniel who kept looking at me like, You’re keeping me up for this?! Wow, that’s a really interesting fact today. I tend to assume people’s language production is indicative of their comprehension. It’s important to remember it isn’t always, I suppose. If I ever have a Spiderman-obsessed kid, I think trying to set up a web in the basement could be a great idea to keep him/her busy and out of my way! Basement webs– I should definitely think about that. Where do you get all these cute costumes? And Jesabes has a great idea with the web in the basement! Entertainment for hours! They came in a box of hand-me-downs from Jeff & Holly’s kids. That looks like so much fun! And Kalena looks awesome in that costume. It was fun! Plus, lots of time spent, but minimal candy acquired. So I don’t feel bad about letting the kids trick-or-treat for real tonight.